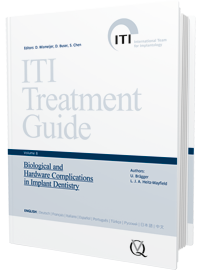 The ITI Treatment Guide series is a compendium of evidence-based implant-therapy techniques and procedures for daily practice. Written by renowned clinicians and supported by contributions from expert practitioners, the ITI Treatment Guides provide a comprehensive overview of various clinical options. The management of different clinical situations is discussed with an emphasis on sound diagnostics, evidencebased treatment concepts, and predictable treatment outcomes with minimal risk to the patient. Volume 8 of the ITI Treatment Guide provides clinicians with the latest evidence-based information on the origins and treatment of biological as well as hardware complications. This analysis of the current evidence is based in part on the proceedings of the 4th ITI Consensus Conference held in Stuttgart in 2008 and of the 5th Consensus Conference held in Bern in 2013, as well as on a review of the current literature. Sixteen step-by-step clinical cases presented by experienced clinicians from all over the world illustrate the diagnosis and treatment of complications. The forthcoming Volume 9 of the ITI Treatment Guide series will address implant therapy in geriatric patients.